Mallory–Weiss syndrome or gastro-esophageal laceration syndrome refers to bleeding from a laceration in the mucosa at the junction of the stomach and esophagus. This is usually caused by severe vomiting because of alcoholism or bulimia, but can be caused by any conditions which causes violent vomiting and retching such as food poisoning. The syndrome presents with hematemesis. The laceration is sometimes referred to as a Mallory-Weiss tear. Mallory–Weiss syndrome often presents as an episode of vomiting up blood (hematemesis) after violent retching or vomiting, but may also be noticed as old blood in the stool (melena), and a history of retching may be absent. In most cases, the bleeding stops spontaneously after 24–48 hours, but endoscopic or surgical treatment is sometimes required and the condition is rarely fatal. It is often associated with alcoholism and eating disorders and there is some evidence that presence of a hiatal hernia is a predisposing condition. Forceful vomiting causes tearing of the mucosa at the junction. NSAID abuse is also a rare association. In rare instances some chronic disorders like Ménière's disease that cause long term nausea and vomiting could be a factor. The tear involves the mucosa and submucosa but not the muscular layer (contrast to Boerhaave syndrome which involves all the layers). The mean age is more than 60 and 80% are men. Hyperemesis gravidarum, which is severe morning sickness associated with vomiting and retching in pregnancy, is also a known cause of Mallory-Weiss tear. 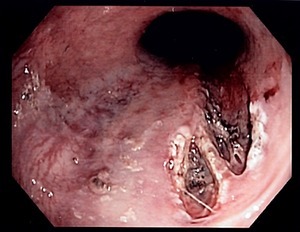 Definitive diagnosis is by endoscopy. Proper history taking by the medical doctor to distinguish other conditions that cause haematemesis but definitive diagnosis is by conducting esophagogastroduodenoscopy. Treatment is usually supportive as persistent bleeding is uncommon. However cauterization or injection of epinephrine to stop the bleeding may be undertaken during the index endoscopy procedure. Very rarely embolization of the arteries supplying the region may be required to stop the bleeding. If all other methods fail, high gastrostomy can be used to ligate the bleeding vessel. It is to be noted that the tube will not be able to stop bleeding as here the bleeding is arterial and the pressure in the balloon is not sufficient to overcome the arterial pressure. The condition was first described in 1929 by G. Kenneth Mallory and Soma Weiss in 15 alcoholic patients. Boerhaave syndrome – Full thickness esophageal ruptures also often secondary to vomiting/retching. ^ Sattar, Husain A. (2011). Fundamentals of Pathology. Pathoma, LLC. ISBN 9780983224600. ^ Caroli A, Follador R, Gobbi V, Breda P, Ricci G (1989). "[Mallory-Weiss syndrome. Personal experience and review of the literature]". Minerva dietologica e gastroenterologica (in Italian). 35 (1): 7–12. PMID 2657497. ^ Parva M, Finnegan M, Keiter C, Mercogliano G, Perez CM (August 2009). "Mallory-Weiss tear diagnosed in the immediate postpartum period: a case report". J Obstet Gynaecol Can. 31 (8): 740–3. PMID 19772708. ^ Gawrieh S, Shaker R (2005). "Treatment of actively bleeding Mallory-Weiss syndrome: epinephrine injection or band ligation?". Current gastroenterology reports. 7 (3): 175. PMID 15913474. ^ Weiss S, Mallory GK (1932). "Lesions of the cardiac orifice of the stomach produced by vomiting". Journal of the American Medical Association. 98: 1353–5. doi:10.1001/jama.1932.02730420011005. This page was last edited on 16 January 2019, at 17:18 (UTC).